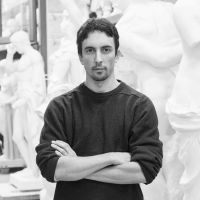 In the 2010s he began to produce his first works to gain recognition in the art world, an initial series of images, ‘Art Game’ raising the question of digital’s place among classical art in museums. His series ‘Hipsters in Stone’ followed rapidly bringing great visibility from 2012 onwards. Through the gesture of dressing statuary in the Louvre, that may perhaps at first seem merely humorous, Leo Caillard raises the question of our social codes and our own representation as individuals. Since 2013, Leo Caillard has produced many sculptures in the same spirit of dialogue across time. He expanded the concept of marble and bronze works wearing clothes through the aesthetics of the classic bust modified by adding contemporary accessories. The ‘Hipsters in Bronze’ series conveys these creations that have quickly earned a place within private collections and exhibitions. Since 2015, Leo Caillard has been working on new creations based on light interacting with stone. His meticulous and scientific hallmark is exposed in poetic and subtle works where the conceptual creation seeks to emphasise the dialogue between solid matter and abstract matter: solid and hollow, tangible and quantum. As his work gains in definition each year, there are strong parallels with contemporary artists such as Damien Hirst and his recent exhibition at the Venice Biennale, Koons and his Gazing Balls, as well as Olafur Eliasson with his recent luminous creations. In response to the question regarding which artistic movement Leo Caillard belongs to, he replies creatively that he is part of a new and ultra-contemporary movement. 2018London King's College Public Installation - " Classical Now "